First, let's not get lost in translation. Sambal is a generic term for chili-based sauces. Nasi goreng means "fried rice". Literally, there is nothing about nasi goreng that requires it to be spicy. But since nasi goreng is a Malay term, the Malay (and I don't mean Malaysian) style of cooking fried rice has associated nasi goreng with spicy fried rice with bold flavors. In other words, that nasi goreng is spicy is more of a cultural association than a literal definition. That said, let's proceed to this sambal fried rice recipe. To make the spice base, I combined sambal oelek (available in Asian groceries), crushed galangal (also available in Asian groceries), fresh garlic, onion, kaffir lime leaf and lemongrass. Can you imagine the aroma? Of course, you can go fresh all the way and use fresh chilies instead of sambal oelek. But because sambal oelek is already a spice blend, chilies alone won't do. You'll have to have a myriad of other spices like cloves, cumin, ginger... As for galangal, even in Southeast Asia, it is not always easy to find. So, you get the idea. The store-bought components of the spice paste is for convenience. Make the sambal. Place the sambal oelek, galangal, garlic, shallots, kaffir lime leaf and lemongrass in in a blender or food processor and process just until pasty. You can also do this with a mortar and pestle. Heat the sambal in a wok or frying pan; saute (medium-low heat, please!) until the solids separate from the oil and the mixture smells lightly toasted and highly aromatic. Add the meat and carrot. Season with the soy paste. Stir fry (very high heat!) for about half a minute. Add the rice and scallions. Season with salt. Stir fry until the rice is heated through and the color is even. 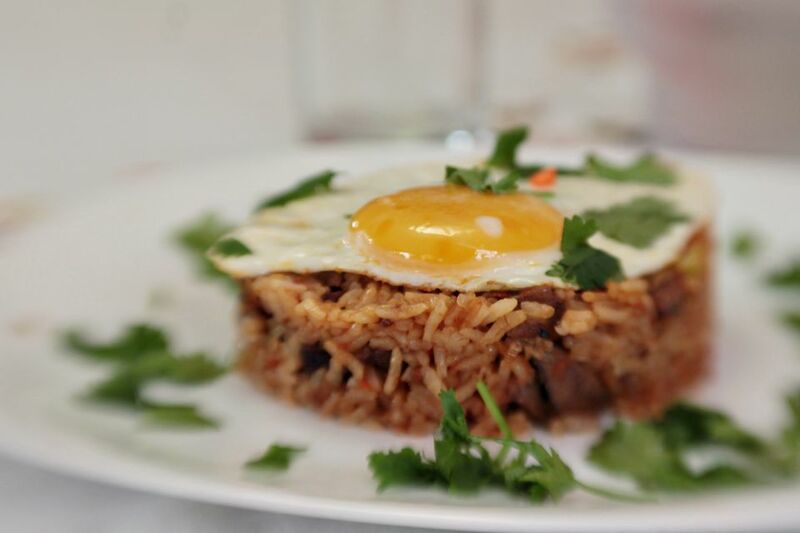 To serve, ladle some sambal fried rice on a plate, top with a fried egg and sprinkle with chopped cilantro.